Where is the store gone? I can't get to the store, did you move? moss&mink is housed on it’s own sim, so the store has not moved. If you are unable to reach the mainstore, it may be because of Second Life sim restarts, which happen on tuesdays PDT. If that is not the case, the sim is also taken down for a few days at the start of each season for season changeover. So if it is the start to mid of March, June, Sept or Dec that may be why. Please click for the section on HUD troubleshooting. There's something wrong with the item itself. If you find a fault with an item, please do let us know. I do my best to check my items before they are packaged, but I am human and sometimes I might have missed something. I always want to know so I can fix any faults and get a redelivery sent out to anyone who purchased. I can't get into the event, can you just sell the item to me? It is part of the rules when signing up for events that items remain exclusive to that event until the round is over. As such, I am unable to sell you the item outside of the event until that time. Please remember, all events are busy in the first 1-3 days of opening, be patient, you will get in, and there will be many amazing items to see when you do. I purchased an item, but didn't receive it. Please first check local chat to see if there is any messages there as to why. You may have previously purchased the item, and in that case the vendor will have refunded you and notified you in local chat. If this is not the case, please check your transaction history to see if the payment was processed. Sometimes, especially if the vendor is in use by other people as well, it can drop the transaction. If your payment wasn’t taken, please try repurchasing. If your payment was taken, but you did not receive the item, you can use the redelivery terminal in store to have your purchase redelivered. In very rare cases, the vendor system servers go down, and the vendor takes payment, but the system is not able to log the sale and carry out delivery of the product. 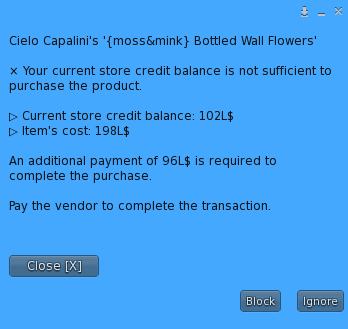 If you confirm that you were charged, not refunded, and your purchase is not showing when you use the redelivery terminal, please send an IM to Cielo Capalini with the transaction details. Your transaction will be manually entered and a delivery sent out for you. The Redelivery terminal is a big heart shaped button with a delivery truck on it, to the left of the front counter at the mainstore landing point. Click the Redelivery button and it will direct you to a page that shows all your past purchases. In the very right hand column is the redeliver button. If your window is not wide, you may need to scroll across to the right to see the option. I accidentally bought the item twice. i have in place for the vendor system to refund double purchases, so please check your transaction history to ensure your second purchase wasn’t already refunded. If the vendor system failed to refund the duplicate purchase, please IM Cielo Capalini with the transaction IDs and details and a manual refund of the second purchase will be sent to you. I bought the wrong item, or changed my mind. As these are digital items, that cannot be returned, all purchases are final. There are display demos of every item, so please inspect and/or use the items to be sure of your purchase before proceeding. 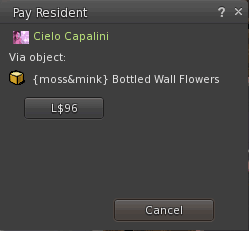 I would love to have moss&mink in my event! Super happy to be invited to events, but please understand I can’t always accept, I’m just one girl. Unless, of course, you can provide me with some form of time dilation device… then I will make you all the things!! 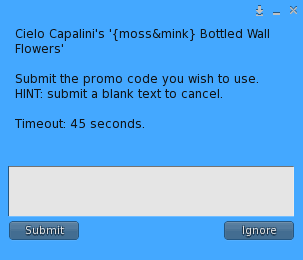 Please drop a NC with the event info, or an IM to a web link that details the event, to Cielo Capalini. I have a Mall / Affiliates / Store space to offer. I am not interested in affiliates or any store space at this time, please do not ask. Can you make a custom item for me? I do not offer custom mesh at this time. I do not sell or give away my textures. Can you modify this item for me? I don’t offer custom mods for people, but I do take suggestions for updates to products. Please feel free to drop me a NC with specifics on what you might be looking for. Try to be as detailed as you can. Or instead of “Make this cuter!” you could suggest “Please can you add a ruffles option onto the biggest pillow, and sparkly gemstones around the bottom edge”. Can you teach me how to create items? Unfortunately I don’t generally have the time to help walk others through learning to mesh in Blender, so here is some helpful links that might aid you in your creating. If you’re completely new to 3d modeling, this is a pretty good place to start. Here’s a post talking about the mesh uploader. 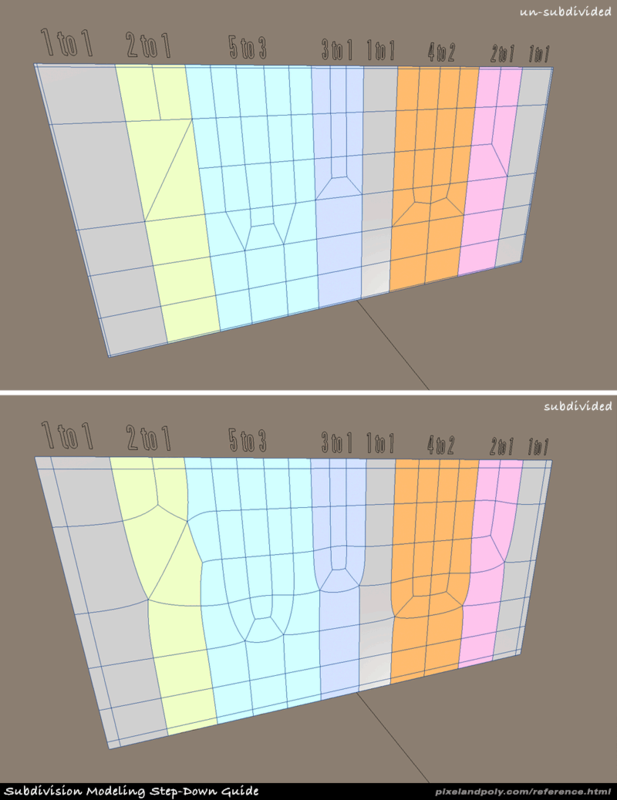 Vertex normals are important! here’s a cool trick to manipulate them into doing what you want. If you did not receive your item due to SL issues, please send a notecard or IM with the transaction ID and in world local chat of the failed transaction. Screencaps/gyazos are great too. I played lots, can you give me or trade me this item? Gacha is a luck-based game. I will not give or trade items. There are many gacha trade groups available if you are looking to swap what you have already won for something else, or you can even ask in the moss&mink vip group. Can you sell me this specific item? Gacha items will not be sold seperately. I bought this item and it is broken! I will only give support for items purchased from me. If you bought it from a yardsale/reseller/MP and it is broken, please contact the person you purchased it from. If the item was purchased from one of my machines, please send me an IM letting me know of the issue. Can I get a copy version of this item? I do not offer permission changes for individual gacha items. Can I trade a Full set for a Full Copy set? I do offer trade of full sets for a copy version set. Items need to be from my machine or exchanged for in trades. I have sale logs, including what was won, and I totally understand if you needed to trade items for others, gacha machines can be mean, I know that. So long as there’s enough plays for you to realistically have a full set. Help, I lost one of my gacha items!! I am not responsible for no-copy items if you lose them. If you have widespread inventory loss through no fault of your own, please contact Linden Labs, they do have processes to perform recovery on inventory loss, which is successful in most cases. I will give copy versions of lost items only, upon confirmation from Linden Labs that they were unable to successfully recover your inventory loss. I was trading, and someone stole my item. I am not responsible for items lost during trades or second-hand purchases. 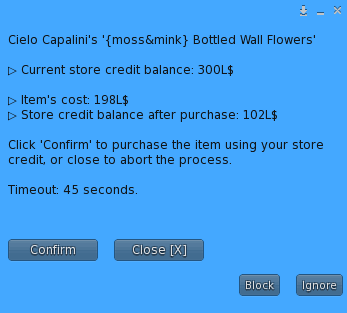 If you ever aren’t sure how much Store or Gift Credit you have, you can easily check by using any moss&mink product vendor. First, right click on the vendor and select ‘Menu’. You will then see a popup on your screen, similar to the image on the right. Click the ‘View Balance’ option. 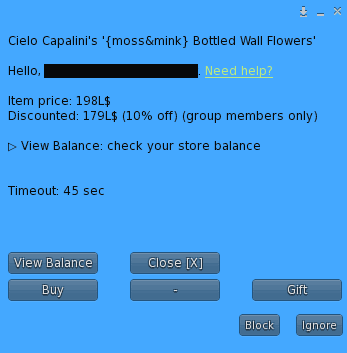 Your current Store credit & Gift card balances will be printed to local chat, like in the image on the right. You receive 10% Store Credit with every regular item (non-gacha) purchase from moss&mink. Your Store Credit accumulates and can be used to pay for or offset future purchases. To use your Store Credit for a purchase, right click a product vendor and select ‘Menu’. You will see a popup window similar to the image on the right. On the next screen you will see listed the different purchase options for the product. Click the ‘Store Credit’ option. On the next window, if you have enough Store Credit to pay for the entire purchase, you will see your current Store Credit balance, the Item’s cost and how much store credit you will have remaining if you continue with the purchase. Click ‘Confirm’ to complete the purchase. 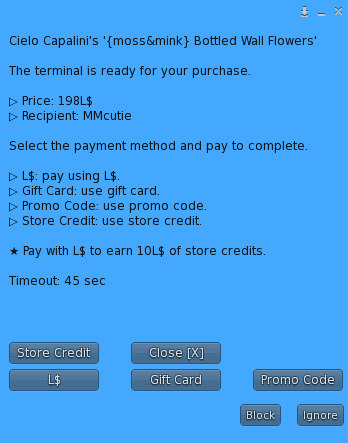 If you do not have enough Store Credit to pay for the entire purchase, you will see listed your Store Credit balance, the Item’s cost, and how much difference in lindens you will need to pay to complete the purchase. When you pay the vendor now, you will see it requests the difference amount to be paid. Upon paying the difference amount, the vendor will subtract the store credit amount and process your purchase. Gift Cards can be purchased from the moss&mink front counter. Once purchased they can be given away as a gift, or used yourself to add to your Gift Card credit balance. See below for how to redeem and use Gift Cards. To use a Gift Card, simply wear the card and you will see a popup similar to the image on the right. 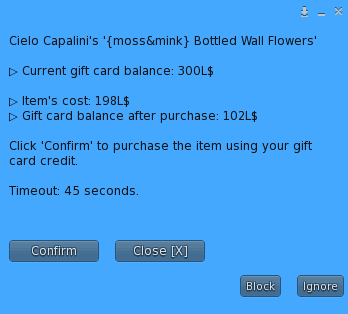 The popup will confirm the Gift Card amount and ask if you want to redeem the Gift Card. To redeem the Gift Card, and add the Gift Card amount to your personal Gift Card credit balance, click the ‘Use Card’ button. To ensure cards aren’t accidentally redeemed, you will be asked to confirm if you really want to use the card. After this point the card will be redeemed, you cannot undo. So be absolutely sure before you click yes. If you are sure you want to redeem the card, click ‘Yes’. The next window will confirm that you have successfully redeemed the Gift Card and what your new Gift Card credit balance is. Click the ‘Gift Card’ option. On the next window, if you have enough Gift Card balance to pay for the entire purchase, you will see your current Gift Card balance, the Item’s cost and how much Gift Card balance you will have remaining if you continue with the purchase. If you do not have enough Gift Card balance to pay for the entire purchase, you will see listed your Gift Card balance, the Item’s cost, and how much difference in lindens you will need to pay to complete the purchase. Upon paying the difference amount, the vendor will subtract the gift card balance amount and process your purchase. Gifting a moss&mink product just takes a few simple steps. 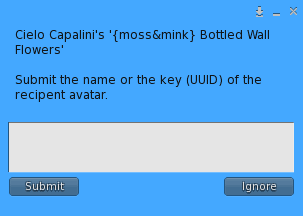 You will then be prompted to enter the name or UUID of the user you would like to gift the item to. Enter your special person in the box, and click the ‘submit’ button. The next window will list the price of the item, your special persons name, and ask how you would like to pay for the gift. Choose your preferred option to make payment and complete the gifting process. 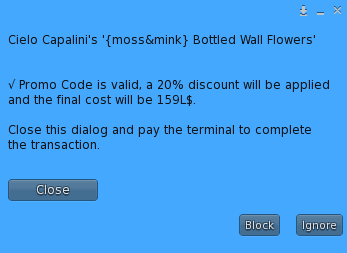 If you have a moss&mink Promo Code, you can easily get a great discount on your purchase. Click the ‘Promo Code’ option. You will be presented with a spot to enter your promo code. Enter your Promo Code in the box, and click ‘Submit’. The promo code will confirm if it is valid and what the promo code offer will do, and how much the product will now be with the promo code applied. 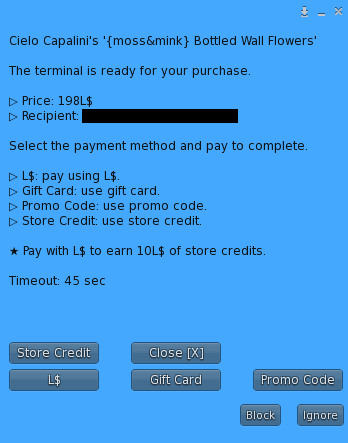 You can now pay the terminal the new discounted price to complete your purchase. ** Promo Codes cannot be used in conjunction with Store Credit or Gift Card credit. IMPORTANT: Please check your HUD type. If you have a Universal HUD, select that option. Are you close enough to the product? The standard hud is set for ‘chat range’ distance, so you need to be within 20 metres of the product for the HUD to be able to ‘talk’ to the product.